Are you already feeling the christmas stress? Or is everything already arranged and the whole Christmas menu a done deal? I am taking it really easy this year as we are going out for dinner. Twice… It’s actually not such a bad feeling to not having to do a thing, but also a little weird. We have been cooking lots of Christmas recipes of course but no cooking required for the two days of Christmas. A few weeks ago I was organizing some of the Christmas recipes and noticed I have a load of desserts for Christmas but not so many mains…. Lol… Wonder why that is…? 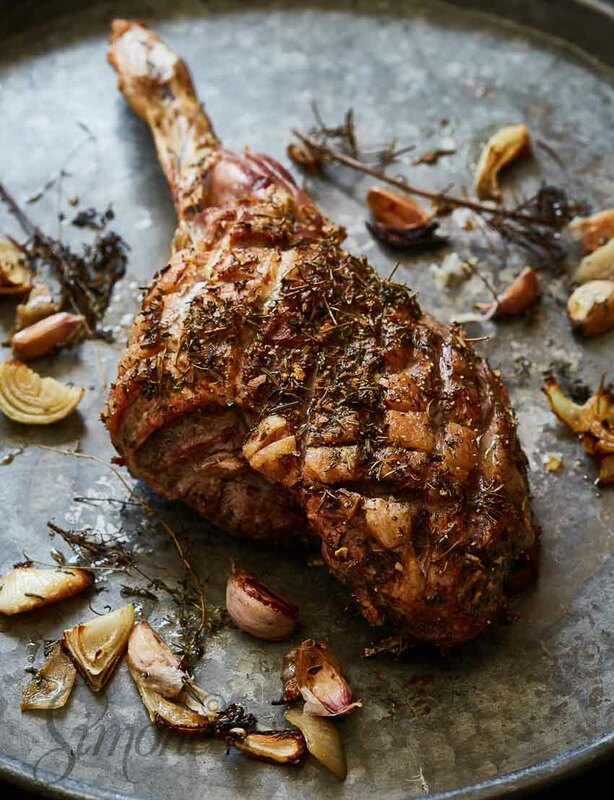 And then I remembered that perfect leg of lamb that we made for my cookbook and it seemed like a good idea to share that with you right now. To be honest I am not the biggest fan of lamb. If it tastes just a little bit of sheep I am done. Yuck… So a good piece of meat, from a good sustainable butcher is important. Essential I would say. Preferably find a piece with the bone still in it. Because that gives a great deal of flavor to the meat. And it is worth the trouble finding that. Not sure how it is in your part of the world but here in the Netherlands it is not easy finding a good piece of lamb. Let alone find one with bone attached. We have a specific place where we found that they have good meat and so we ask them to keep a piece separate for us when we need it. Preparing the leg takes a bit of time, but you don’t need to sit in front of the tv the whole day so while it is roasting in the oven you can entertain your guests or work on something else. 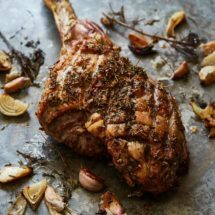 The lamb combines perfectly with roasted vegetables, roasted Brussels sprouts with hazelnuts or roasted cauliflower. And for dessert you could do another favorite from my book; the Chocolate Chip Surprise! Cut the lamb on the fatty side. Make incisions of around a centimeter deep in diamant shape. Remove the needles from a few rosemary twigs and thyme and cut them finely. Chop a few of the garlic cloves aas well. 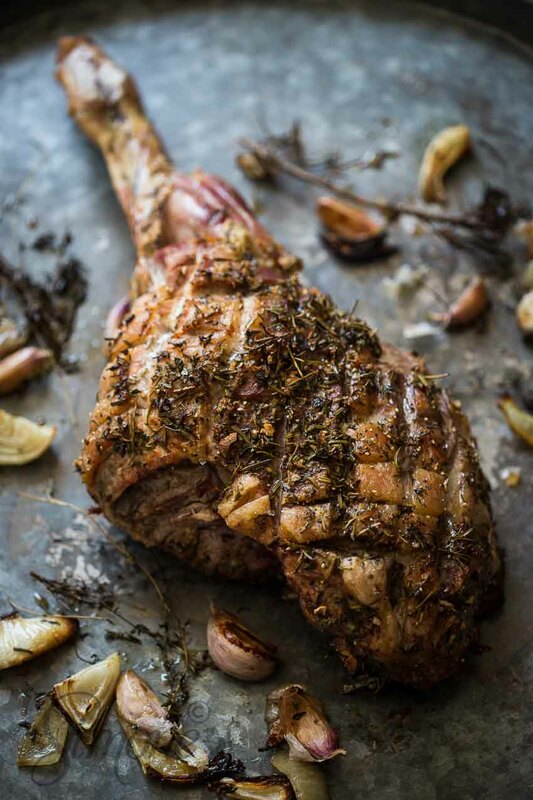 Rub the lamb well with olive oil and the herb mixture. Make sure you press it inside the cuts. Sprinkle liberally with salt and pepper. Preheat the oven on full temperature (usually around 230˚C) Take the rest of the garlic apart into separate cloves and smash them on the side with a large knife. 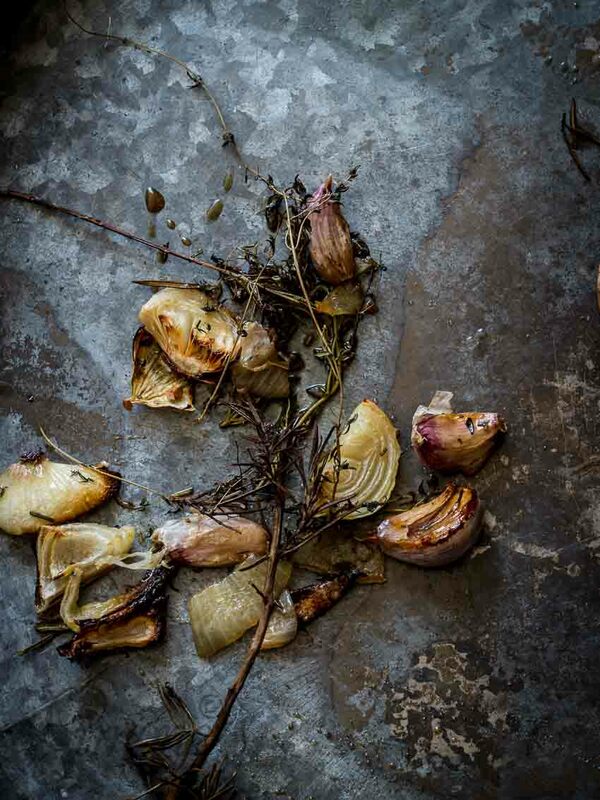 Spread the onion, a part of the garlic, thyme and rosemary across the bottom of a baking tray. Place the leg of lamb on top and sprinkle with the rest of the garlic and the herbs. Place in the oven and lower the temperature immediately to 150˚C. Use the thermometer as that is the only way to be sure that your meat has reached the desired temperature. Medium pink is around 60˚C. You can keep it in the oven longer but never go further than 70˚C. Remember that it will continue cooking once out of the oven too! JOIN OUR NEWSLETTER AND NEVER MISS A RECIPE AGAIN! Subscribe and receive the bi-weekly newsletter with latest content and more. Welcome to In Simone's Kitchen! My name is Simone and I am a food photographer, recipe developer, nutritionist, trainer hormone factor and cat lover. I live in the Netherlands but I love to travel all over the world and share the culiinary finds with you.